Verizon’s LTE Outage: What’s the Fallout? Though according to Verizon the day-long service outage of its brand-new 4G LTE network is now fixed and to be forgotten, it remains to be seen what the full fallout is over the still-unexplained service interruption, which cut off Verizon 4G customers from their high-speed wireless data connection earlier this week. vendors quickly identified the issue and solved it. - Customers using the ThunderBolt have normal service. network when moving between 3G and 4G. This will continue to improve. Granted, the LTE outage wasn’t on a business-catastrophe par with the Amazon breakdown — even though Verizon is claiming 565,000 active devices on its LTE network it’s doubtful that any big businesses are betting their entire communications infrastructure on those connections just yet — but the lack of transparency about the outage is hardly confidence-building. And despite several queries Verizon has yet to answer the question about if and when its next 4G smartphone, the Samsung Droid Charge, will launch since its previously scheduled arrival date of April 28 has apparently been pushed back indefinitely. Another 4G LTE device that is also being delayed — in part due to what Motorola is calling LTE software problems — is the Motorola Droid Bionic, another of the LTE smartphones that Verizon was confidently showing way back at CES in January. Separately, none of these issues would be a very big deal. But with numerous device delays and an unexplained nationwide network crash, the question needs to be asked whether or not Verizon’s new fast network is really solid, or whether it’s still in a sort of beta mode with kinks left to be worked out. At least, that may be the questions users ask when deciding whether or not to sign up for 2-year contracts for a network that might not be there when you need it — and a provider that doesn’t tell you why afterwards. UPDATE: Andy Abramson, a pro’s pro when it comes to public relations, also thinks Verizon needs to tell more about the outage. So does our old pal Wayne Rash over at eWeek. As the tech-reporting world spins another batch of headlines that basically say “keep waiting to hear more about Verizon LTE service pricing,” it’s worthwhile to start guessing what might be the most attractive of Big Red’s 4G LTE pricing, device and plan options. While LTE-powered smartphones like the HTC Thunderbolt (hey wasn’t that supposed to be on the shelves already? Or should we not believe the so-called exclusive confirmations?) might look like a good all-in-one purchase (smartphone, hotspot), what about the possibility of a bundle that includes a LTE standalone mobile hotspot and a Verizon iPhone? The latter would combine the world’s most popular smartphone platform with theoretically the fastest commercial network in the U.S.; is that more of a draw than an all-in-one Android combination? Especially if the Android phone in question is $250 or $299 as rumored and an iPhone can be had for $200? 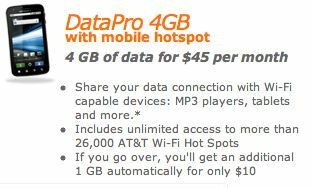 If the 4G pocketspots are under $100, isn’t the idea of a future-proof 4G connection (the mobile hotspot) and the best-supported smartphone (the iPhone) as compelling as an all-in-one 4G phone with Android? While we admire the marketing machinery that lets Verizon score headlines for not really saying anything at all about pricing — other than that someday, sometime, it will actually offer LTE services for sale — maybe the coyness is because Verizon knows that once it releases an official set of prices and plans for any one of its forthcoming 10 LTE devices the permutations like the one above will start in real time.